The Model 8872 is a true digital site platform for all your site needs, including traditional I/O, direct polling of serial / Ethernet based equipment (improving on the 8832’s existing capabilities), and providing a host platform for other required site software such as APICOM, iPort, etc. All controlled by a fully graphical user interface, familiar to any AirVision user. The Model 8872 offers solid state storage for 10,000,000 data storage points (100x that of the Model 8832). That’s equivalent to minute data for 5 years. After that. point, the unit will internally archive for an additional 100,000,000 data points if needed. The Model 8872 comes with four (4) serial ports, and can be expanded to an additional 32 serial ports, if needed. And, of course, Ethernet is available for communication to Ethernet-based instruments, DSL, wireless, satellite, etc. Automatic sync over TCP/IP to AirVision, including data, configuration, logbook entries, chart annotations, etc. What about the problems normally associated with PC-based loggers? Agilaire’s goal is to ensure the Model 8872 meets the reliability standards set by the Model 8816 and 8832. Given that the 8872 relies on the Windows OS, this is no small feat. However, Agilaire spent two years in design and testing before confirming the viability of the PC-based platform, and only after numerous design elements and improvements (drawn from our 30-year history of reliable data acquisition systems) to ensure the real-time processes are not hung up, causing data loss. The Model 8872 represents the best PC-based logger on the market by a large margin. 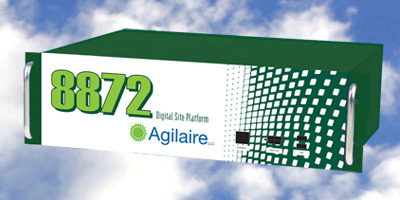 No reviews were found for Agilaire SiteNode - Model 8872 - Ambient Air Data Logger. Be the first to review!